When International Studies minor Michelle Klassen of Ellicott City, Maryland took Critical Issues in United States History with Dr. Peter Wallenstein, she knew she would have to produce a critical research paper. 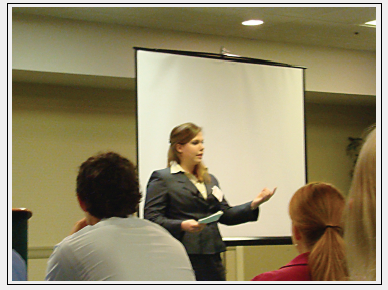 What she did not know was that this research would eventually make her the youngest student presenting at the April 2009 ACC Meeting of the Minds conference at North Carolina State University. Klassen’s research began with an initial conference with Dr. Wallenstein, during which Klassen “began with an interest in rural health in Southwest Virginia” and after which she “kept hearing about widespread abuse and personal devastation associated with Oxycontin through preliminary research and [conversations with] friends that live in the area.” As she continued to discuss and refine her topic with Dr. Wallenstein, Klassen— only a freshman at the time—came to view her topic as one that would allow her to enter into the world of undergraduate research in an interdisciplinary way. Like many students approaching research for the first time, Klassen felt a bit overwhelmed as she began to delve deeply into her topic, but eventually channeled this into a rewarding research experience. “I learned how to do the basics like mastering databases and microfilm but also how to combine seemingly infinite perspectives (law, media, medical, anecdotal, statistical, etc.) into a clear and concise story-line that I could then analyze. It was a journey of putting pieces together until [the story] made sense enough that I could go look for more pieces.” After spending a month diligently focused on this research project, Klassen reflects how the paper came together – almost instantly, “After a month or so of preliminary research, I had a pretty good picture; paragraphs of my paper came together, and, suddenly, I had a story.” She credits Dr. Wallenstein, librarians, and her fellow students for helping and challenging her to create the project. Michelle Klassen is a sophomore from Ellicott City, MD. She studies Agriculture and Applied Economics, concentrating in International Development and Trade with minors in Math and International Studies. While she is serious about preparing herself for graduate school and a career in economic or policy research, she takes joy in the day-to-day process of learning in my classes. She serves as Chaplain in Sigma Alpha, the professional agriculture sorority. Currently, she works for the Agricultural Economics Department doing agricultural law research under Dr. Geyer and tutors at the CAEE Tutoring center. She is actively involved in Campus Crusade for Christ, plays intramural inner tube water polo, and loves exploring all of the trails and caves around the New River Valley.